Christian greetings in the precious Name of our Lord Jesus Christ; it is good see you on the Eve of 2018, at least the twenty-first year of this Newsletter and our twenty-sixth year in cyber space. One subscriber has been with us since Bible Believers' Church BBS which preceded the WWW. I trust you have carefully studied Newsletter 1004 which unfolds mysteries that tie Old Testament scriptures together with the New to confirm where we stand in time. Today's feature "Space Cadets and the New Year" is directed to God's astronauts in Jesus Christ, pressurised by the Holy Spirit, under pre-eminence to the Word, ready to change in the atoms and travel like a thought. Our flight will take "thousand thousands" into the sixth dimension. No hoax like America's faked Moon landing: 'spaceship' Jesus Christ is the one place of safety. The sinking of Los Angeles will signal seven years of Great Tribulation for earthlings; then nuclear warfare will throw earth out of its orbit toward the sun: her flames will leap thousands of miles into space (Malachi 4:1-3; II Peter 3:7-12). Our friend and contributing author Israel Shamir's article "Christmas Gifts—Good News from Around the World" informs us, among other matters of US' Blackwater mercenaries engaged by Saudi Crown Prince MBS beating Saudi billionaires imprisoned in Riyadh's Carlton Ritz, hanged by the feet and given electric shocks to break them down . . . one has died. Also important is a précis of Joe Brandt's 1937 spiritual dreams wherein he saw Los Angeles sink along with Florida, Japan, many islands and mountains as prophesied, with tidal waves sweeping the world (Jeremiah 24:24; Ezekiel 38:20; Nahum 1:5; Luke 21:25; Revelation 6:14; 16:20). This agrees with Brother Branham's prophecies from 1935-1965. Volcanoes will erupt on the Pacific Ring and on the Moon (Joel 2:31; Acts 2:20; Revelation 6:12). If you know these things you are obligated to prove and recognize the most important revelation is the supreme deity of our Lord Jesus Christ. The One Person of God manifest in virgin-born flesh as your KINSMAN Redeemer to pay sin's price. This New Year, repent and be baptized for the remission of your sins [past unbelief]. Take His Name, LORD JESUS CHRIST, as Husband of your soul and enter the invisible marriage union of the Bride and Christ. Do not put off to tomorrow what you should do while it is "today." Run to the water: I will baptize you in His Name and He will bless you with eternal Life this New Year and do immeasurably far beyond your prayers or thoughts according to His power working within you. December 26, 2017 — Breaking with the habits of his predecessors, Donald Trump's National Security Strategy abandons the management of world affairs and lays out the path to the economic and social recovery of the United States. This project, which is perfectly coherent, represents a brutal change that his cabinet will now have to impose on the whole of his administration. Comment: Leon Trotsky and his followers sought worldwide revolution—one totalitarian world government—as opposed to sovereign socialist nations. This accords with the Babylonian Talmud (Pharisaism) and the Judaeo-Roman Catholic church which rule the united States and many nations, and next June or July will likely establish the global government Jesus refused (Matthew 4:8-10; Daniel 9:27; Revelation 17:11-13). The US is "the image unto the beast" of Revelation 13: Donald Trump's rebellion will almost certainly see his presidency terminated before Nisan 14, 2018. December 21, 2017 — China is making a move to break the United States petrodollar stranglehold . . . oil-futures trading in the yuan . . . fully convertible into gold on the Shanghai and Hong Kong foreign exchange markets . . . when it does get off the ground in 2018 . . . this triple oil-yuan-gold route will bypass the mighty green back. Comment: In 1958 Brother Branham prophesied "[Russia's] science is five years ahead of us. And when we're caught up . . . they'll be ten years farther the other way" (The Handwriting on the Wall). And in 1954 he prophesied the invasion of mainland USA, after the earthquake sinks Los Angeles (Invasion of the USA). Who is behind Bitcoin Mania? Coindesk: (December 17, 2017): 2018: The Year Central Banks Begin Buying Cryptocurrency. CNBC: (December 18, 2017): Central Banks could hold bitcoin and ether for the first time in 2018. Quartz Index: (September 25, 2017): Central Banks considering launch of official cryptocurrencies. The fix is in, boys and girls. What is the motive here, you ask? . . . The end-game behind the crypto craze is to usher in a GLOBAL digital currency which, in time, will be very much "centralized" . . .
"THIRTY years from now (i.e. 2018), Americans, Japanese, Europeans, and people in many other rich countries, and some relatively poor ones will probably be paying for their shopping with the same currency. Prices will be quoted not in dollars, yen or D-marks but in, let's say, the phoenix. The phoenix will be favoured by companies and shoppers because it will be more convenient than today's national currencies, which by then will seem a quaint cause of much disruption to economic life in the [last or] twentieth century." "An even more ambitious solution would be to move to a truly global currency, along the lines of Keynes's "bancor," that would circulate alongside countries' own currencies and would offer a store of value truly disconnected from economic conditions and policies in any country. To achieve this, one would need to set up a global monetary institution that would issue the global currency depending on global economic conditions, and that could act as a global lender of last resort. It would need to have an impeccable ("AAAA") balance sheet, and governance arrangements that engender widespread credibility and acceptability." "As telecommunications technology continues to advance, these transactions will be cheaper and faster still." "The phoenix zone would impose tight constraints on national governments. There would be no such thing, for instance, as a national monetary policy. The world phoenix supply would be fixed by a new central bank, descended perhaps from the IMF." This means a big loss of economic sovereignty, but the trends that make the phoenix so appealing are taking that sovereignty away in any case. You see, the gift of 'prophecy' comes easy when you are the one running the show! There is no doubt about this one, boys and girls. Bitcoin was never a "spontaneous" digital currency of "the people" that just "took off." It has been, from the start, a tool of the usual suspects and the play is only getting started. The year 2018 promises to be very interesting. Stay tuned . . . Months before "The Good War" had even ended, the post-World War II monetary system was cooked up at Breton Woods by the US Communist Harry Dexter White and the UK Fabian Socialist and the known sodomite John Maynard Keynes. Keynes advocated a world currency, which he named "Bancor," but he realized that the idea was still too radical for those times. Comment: "[America] was founded on freedom of religion because our forefathers had fled Roman persecution of the modern Jezebel system (Revelation 2:20) . . . and stood many great persecutions and martyrdom under that false system of Jezebel. And according to . . . Revelation the 12th chapter, God had promised them an oasis and a place, for the woman [the church] was carried into the wilderness where she was fed for a time, times, and a dividing of time . . ." (Jezebel Religion, p. 7:53; Revelation 12:6). "[America's] destiny is in the thirteenth chapter. In this image that is mentioned in this chapter will be found all the wickedness of the [papal Roman] beast that was before it. As the beast rose at the Nicene Council, so the image will come out of the World Council of Churches with all ungodly and Satanic power to vent the anger of the Devil upon the true vine of God. It will be a repeat performance of all diabolical cunning and cruelty" (An Exposition of the Seven Church Ages, p. 131:3). "When God sends forth a Message and tells the people, and they don't receive it, then He withdraws His servant and sends His plagues: famine, death, spiritually speaking, physically also. You watch for a depression, brother. You think you've seen something; you just wait after while. You haven't seen nothing . . . (Jezebel Religion, p. 22:100). This world is hostage to the international banksters of the City of London. There is no safety in man or mammon (Luke 16:13). Christ will take His Bride Home, leaving the world to wrath: you must get into Christ NOW by recognizing and understanding YOUR day and ITS Message that your life becomes "an epistle known and read of all men". December 14, 2017 — The BRICS (Brazil, Russia, India, China and South Africa) are going to set up their own system for Internet governance so as to bypass US control. What we know as the Internet today, has been governed by ICANN (Internet Corporation for Assigned Names and Numbers), a para-administrative association of the US Trade Department. December 25, 2017 — It is a beautiful and serene time of hope, when the darkest time of the year is already behind us. Though the light is still not perceptible, we know and feel that the change is coming. Trump also suggested the US could cut off aid for countries that opposed it in the UN vote. These threats had been counterproductive: only nine states, the usual suspects including the ex-US dependencies in the Pacific voted for the Zionists. Even Canada, ever supportive of Israel and as heavily Zionised as anybody, didn't vote for the US and Israel, because the Trump threats made it nearly impossible for an independent state to do so. If Zionists thought they already rule the world, the vote came and proved their triumphant reports were somewhat premature. "We are not Zionist slaves," the nations of the world said. I love these decisions of Trump: they undermine the Imperial hold on the world more than anything Putin could ever do. Did he plan it? Did the rain plan to facilitate wheat growth? What is important is that Trump is doing it well. Cutting the US contribution to the UN budget is also good, as it ushers us to the blessed times when the US won't order nations around. Is there a flip side? Not really. 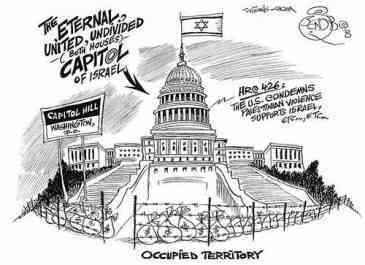 The US decision on Jerusalem has been deemed null and void. The Palestinians are justifiably angry, but they are also encouraged by world support. Before the Trump recognition, they were smothered by silence, now their struggle is back in the limelight. The Turks assumed their traditional place in the lead of the Muslim Ummah (Islamic equivalent of "Christendom"). Iran has been reconciled with its Sunni neighbours. In short, rarely has a decision by the US President made such a positive shift as Trump's Jerusalem decision. Even Israeli Defence Minister Mr. Lieberman . . . refrained from bombing Gaza despite a few stray rockets, and he watched placidly as Assad's troops cleared the pockets of jihadis on the Syrian side of the Golan Heights armistice line . . . in normal times, he would . . . send his air force to strafe them. Suppression of Palestinian protests has been less fierce than usual, too. A legless invalid protester in his wheelchair was killed by a well-aimed shot of a Jewish sniper, a teenage girl who slapped an Israeli officer has been taken to jail, a lot of tear gas has been fired in Bethlehem; but by Israeli standards, the repression has been restrained . . . The Beast of Riyadh has been forced to vote against his best friends America and Israel. He tried again to convince . . . Mahmoud Abbas, the PNA President, to accept "the American Peace Plan," and in vain. Even before the Trump recognition, Abbas declined the offer; now it would be suicidal. But don't weep for MBS. He keeps milking his relatives and notables, locked up in the Ritz Carlton. One of them, Royal Guard Major General Ali Alqahtani died under torture. His family had difficulty recognising his body—too many electric shocks. The price tag for the freedom of al-Waleed bin Talal, the richest detainee, has been placed at $6 billion dollars, some 30% of his net worth, but probably 70% of his unencumbered assets. The Dog Still Does Not Bark, that is the world media keeps mum about this shakedown, and this is good news for MBS . . .
"The mood among Saudis I spoke with was: "Just turn them all upside down, shake the money out of their pockets and don't stop shaking them until it's all out!" Moreover, I am sure the Americans would applaud if their billionaires were to get the MBS treatment. The Russians were mighty pleased when Putin locked up the oligarch Khodorkovsky, and complained that he was the only one to be jailed. They would love to see the whole lot of oligarchs who plundered Russia through manifestly fraudulent, staged auctions under [Jewish] American advisers in Yeltsin's days, to be shaken "until it's all out". Comment: Follow the links in Brother Israel's article as they affirm our consistent teaching in accord with Isaiah, Ezekiel, Daniel, Zechariah, Jesus Christ and Brother Branham that the strategy of Jewry is to reconquer and re-communize Russia, destroy the Papal Roman beast and her US image and usurp Lucifer's one world government promised by the Babylonian Talmud and refused by Jesus Christ (Matthew 4:8-9). I woke up in the hospital room with a terrific headache—as if the whole world was revolving inside my brain. I remember, vaguely, the fall from my horse—Blackie. As I lay there, pictures began to form in my mind—pictures that stood still. I seemed to be in another world. Whether it was the future, or it was some ancient land, I could not say. Then slowly, like the silver screen of the "talkies," but with colour and smell and sound, I seemed to find myself in Los Angeles—but I swear it was much bigger, and buses and odd-shaped cars crowded the city streets. I thought about Hollywood Boulevard, and I found myself there. . . I noticed there was a quietness about the air, a kind of stillness. Something else was missing. . . There were no birds. . . Had they gone away? Again, I could hear the stillness. Then I knew something was going to happen. I wondered what year it was. It certainly was not 1937. I saw a newspaper on the corner with a picture of the President. It surely wasn't Mr. Roosevelt. He was bigger, heavier, big ears. . . The next day: Gosh, my headache is worse. It is a wonder I didn't get killed on that horse. I've had another crazy dream, back in Hollywood. . . I looked up at the clock down by that big theatre. It was ten minutes to four. Something big was going to happen.
. . . early spring. . . I've been to the end of the world—there isn't anything left. Not even Fresno, even though I'm lying here right this minute. If only my eyes would get a little clearer so I can write all this down. There was a funny smell. I don't know where it came from. I didn't like it. A smell like sulphur, sulphuric acid, a smell like death. For a minute I thought I was back in chem. [Chemistry class].
. . . I thought I would stand there looking at that clock forever waiting for something to come. . . Then, when it came, how it came. Like nothing in God's world. Like nothing. . . You felt it long before you saw it, as if the sidewalks wouldn't hold you anymore. I looked out at the cars. . . The shaking had started again, but this time different. It was a nice shaking, like a cradle being rocked for a minute, and then I saw the middle of the Boulevard seem to be breaking in two. The concrete looked as if it were being pushed straight up by some giant shovel. It was breaking in two. . . the waters kept oozing—oozing. The cries. God, it was awful. I woke up. I never want to have that dream again. It came again. Like the first time which was a preview and all I could remember was that it was the end of the world. I was right back there—all that crying. Right in the middle of it. My eardrums felt as if they were going to burst. Noise everywhere. People falling down, some of them hurt badly. Pieces of buildings, chips, flying in the air. One hit me hard on the side of the face, but I didn't seem to feel it. I wanted to wake up, to get away from this place. It had been fun in the beginning, the first dream, when I kind of knew I was going to dream the end of the world or something. This was terrible. There were older people in cars. Most of the kids were on the street. But those old guys . . . Nobody could help anybody. It was then I felt myself lifted up. . . I was over the city. It was tilting toward the ocean—like a picnic table. The buildings were holding . . . people saw they were holding and they tried to cling to them or get inside. . . A building dies just like a person. It gives way, some of the bigger ones did just that. . . I couldn't look anymore at the people. I kept wanting to get higher. Then I seemed to be out of it all, but I could see. I seemed to be up on Big Bear near San Bernardino, but the funny thing was that I could see everywhere. I knew what was happening. The earth seemed to start to tremble again. I could feel it even though I was high up. This time it lasted maybe twelve seconds, and it was gentle. You couldn't believe anything so gentle could cause so much damage. But then I saw the streets of Los Angeles—and everything between the San Bernardino mountains and Los Angeles. It was still tilting towards the ocean, houses, everything that was left. I could see the big lanes—dozens of big lanes still loaded with cars sliding the same way. Now the ocean was coming in, moving like a huge snake across the land. I wondered how long it was, and I could see the clock, even though I wasn't there on the Boulevard. It was 4:29. It had been half an hour. I was glad I couldn't hear the crying anymore. But I could see everything. I could see everything. Then, like looking at a huge map of the world, I could see what was happening on the land and with the people. San Francisco was feeling it, but she was not in any way like Hollywood or Los Angeles. . . I shut my eyes for a long time—I guess ten minutes—and when I opened them I saw Grand Canyon. When I looked at Grand Canyon, that great big gap was closing in, and Boulder Dam was being pushed, from underneath. And then, Nevada, and on up to Reno. Way down south, way down. Baja, California. Mexico too. It looked like some volcano down there was erupting, along with everything else. I saw the map of South America, especially Colombia. Another volcano—eruption—shaking violently. I seemed to be seeing a movie of three months before—before the Hollywood earthquake. Venezuela seemed to be having some kind of volcanic activity. Away off in the distance, I could see Japan, on a fault, too. . . it started to go into the sea. I couldn't hear screaming. . . In a minute or two it seemed over. Everybody was gone. There was nobody left. [Brother Branham said: "Japan . . . she's ready to rock to pieces right now. And here's no way you can stop it, because they have neglected to do exactly what God told them to do. Instead of preach of Gospel, they have built buildings, and had fine scholarships, and educations" (Uncertain Sound, #61-0415E)]. I didn't know time now. I couldn't see a clock. I tried to see the island of Hawaii. I could see huge tidal waves beating against it. The people on the streets were getting wet, and they were scared. But I didn't see anybody go into the sea. I seemed way around the globe. More flooding. Is the world going to be drenched? Constantinople. Black Sea rising. Suez Canal, for some reason seemed to be drying up. Sicily—she doesn't hold. I could see a map. Mt. Etna. Mt. Etna is shaking. A lot of area seemed to go, but it seemed to be earlier or later. . . England—huge floods—but no tidal waves. Water, water everywhere, but no one was going into the sea. . . New York was coming into view—she was still there, nothing had happened, yet water level was way up. Here, things were different. People were running in the streets yelling—"end of the world" . . . I heard—or somehow I knew—that somewhere in the Atlantic land had come up. A lot of land. . . The waves were rushing up now. Waves. Such waves. Nightmare waves.
. . . Grand Canyon was pushing together, and Boulder Dam was breaking apart. It was still daylight. All these radio stations went off at the same time Boulder Dam had broken. . .
A prophecy that I made about 1935 or something like that, said: "The time would come (It's written in a book somewhere) that the sea would weep its way into the desert." Look what'll take place. If that thousands of square miles falls down into the lava of the earth and slides in, there'll be millions die at one time. And that'll cause such a tidal wave. . . Remember, plumb up into the Salton Sea is a hundred or two hundred feet lower than the sea level. That water will probably come almost to Tucson with that tidal wave coming across there. And the sea shall weep its way into the desert (William Branham, Trying to do God a Service without being in the Will of God, p. 6:25). [The Spirit of the Lord came upon the Prophet as he was preaching in Los Angeles]: "We don't know what time. And you don't know what time that this city one day is going to be laying out here in the bottom of this ocean." "O, Capernaum," said Jesus, "Thou who exalted into heaven will be brought down into hell, for if the mighty works had been done in Sodom and Gomorrah, it'd have been standing till this day." And Sodom and Gomorrah lays at the bottom of the Dead Sea, and Capernaum's in the bottom of the sea. Thou city, who claims to be the city of the Angels, who's exalted yourself into heaven and sent all the dirty filthy things of fashions and things, till even the foreign countries come here to pick up our filth and send it away, with your fine churches and steeples, and so forth the way you do; remember, one day you'll be laying in the bottom of this sea. You're great honeycomb under you right now. The wrath of God is belching right beneath you. How much longer He'll hold this sandbar hanging over that, when that ocean out yonder a mile deep will slide in there plumb back to the Salton Sea. It'll be worse than the last day of Pompeii. Repent, Los Angeles. Repent the rest of you and turn to God. The hour of His wrath is upon the earth. Flee while there's time to flee and come into Christ." Let us pray" (Choosing a Bride, p. 35:3-5). [And again]: "The last meeting I had in California, while speaking, and didn't know nothing happened till I got on the street, It told California, said, "Capernaum, Capernaum, the city that's called by the name of the angels (that's Los Angeles), you've exalted yourself into heaven, but you'll be brought down into hell. For if the mighty works had been done in Sodom that's been done in you, it would've been standing till this day." "Now, the last few days, the great roaring and popping. Then, here come out a paper of science, said, "It's all honeycombed; it's got to go under." They just know it." "And you watch, the water will come plumb back into the Salton Sea. Los Angeles is doomed for judgment. I tell you before it happened, that you might know when it does happen. I never spoke that by myself. And I've never had Him to tell me one thing but what happened. And you can bear record of that. That's right. When? I don't know." "I went out, and they told me what I said. And I listened, went back and searched the Scripture. You know, Jesus said, almost in them same words about Capernaum; and Sodom and Gomorrah was in the bottom of the Dead Sea, I suppose was then. And later, about a hundred years later, Capernaum slid into the sea, and it's in the sea. The same God that put Sodom in the sea for its sins, the same God that put Capernaum in the sea for its sins, the same God will put Los Angeles in the sea for its sins, that city of corruption" (Works is Faith Expressed, p. 8:61-64). "When will Jerusalem's temple be . . . thrown down"? The answer is in verse 15 which prophesied the legions of Titus in AD70 (Ezekiel 9). "What will be the sign of your [unseen second or (Gk.) 'parousia'] Coming [to Israel]?" The answer is in verse 30 under the manifestation of the Sixth Seal and Seventh Trumpet (verses 29-31), an earthquake of unprecedented magnitude "since men were upon the earth" will mark the end of the Christian dispensation (see Isaiah 64:1-2; Ezekiel 43:2; Joel 2:1-11; Micah 1:3-4; Zechariah 4:7; 14:4-5, 7-8; Revelation 6:12; 8:5; 11:19; 16:18; 18:21-24). This will be the crucifixion of the Son of God [Holy Spirit (Hebrews 6:4-6)], the antitype of the crucifixion of the Son of man [Man] on Calvary, see Matthew 27:52-54. Son of man, Son of God and Son of David, are three 'offices' of one God as Prophet, Priest, and King. Likewise, Father, Son and Holy Ghost are three dispensation claims of the one God, NOT three people, which would make three gods unless language has lost its meaning. Brother Branham called this earthquake "the sign of time". In 1964 he was hunting on Sunset Mountain in the Coronado Forest, Arizona, whence He had been caught up into the Pillar of Cloud the previous year and told to return to his Church at Jeffersonville and preach the Seven Seals which would be revealed to him. One day the Lord told His Prophet, tell Brother Wood to throw up a rock (as in Jeremiah 51:63-64 and Revelation 18:21). When it came down he said, "Within a day and a night you're going to see the glory of God." And the next day a whirlwind came out of the skies. When it went up "It spoke three words in three great blasts." The men only heard the blasting. I understood what it said, and said, "Judgment striking West Coast!" Two days after that Alaska almost sunk. The magnitude 9.2 earthquake that struck Alaska on March 27, 1964 was the second-largest earthquake recorded in modern times (after a 9.5 earthquake in Chile in 1960), and the largest in the written history of North America. It released 100 times as much energy as the 1906 San Francisco earthquake and was followed by tsunamis. During the earthquake, more than 100,000 square miles of Alaska broke, twisted, tilted, dropped and rose. "Since that earthquake, there is a two- or three-inch crack that come in the earth, starting in Alaska, goes around through the Aleutian Islands, comes out about a hundred and fifty or two hundred miles in the sea, comes back up at San Diego; takes in California, or Los Angeles, and comes out again just below the northern part of California there, a little place called San Jose . . ."
"And everything has been said, oh, even to the destruction of California, coming up now, and all these other things. And how I told them how many days it would be, how it would be where this big earthquake happened in Alaska, and that would be the beginning of the sign of time, and what would take place. And just word by word, what It said, it's never failed one time. You've never seen It fail. And It can't fail, because It's God's Words. "And Heaven and earth will pass away, but It can't fail." That's right (Ashamed, p. 7:45-97). Two or three is a witness, the 'third pull' of the Alaska earthquake was an assurance Los Angeles will sink, and the one year matches the year the little Armour girl waited for her Bridegroom as we have waited for 2018, and I believe our year is about up. "What will be the sign of the end of the world [or completion and consummation of the age and the commencement of the millennium]." The answer is a parable commencing in verse 32 which speaks of Daniel's Seventieth Week of seven years that will follow the resurrection of the Church Age saints and the translation of Christ's end-time Bride before the consummation of life on earth and its cleansing by fire for the honeymoon of the Bride and Christ who will step out on the nuclear ashes of the wicked for a thousand years of peace (Malachi 4:1-3). Comment: Tidal waves from the sinking of Los Angeles and a 1,500 x 300 – 400 mile segment of earth's crust should reach the east coast of Australia in about two hours. Buildings and infrastructure on reclaimed land in Singapore, Hong Kong, and Japan and elsewhere are certain to subside owing to liquefaction of reclaimed land during earthquakes. All nature testifies there is a resurrection of the dead. But it can only rise if it serves God's purpose. If a flower lives but is not fertilized, it will not rise again. If you plant corn, and it is not fertilized it will not rise again. Everything that serves God's purpose has a resurrection. Whatever does not serve His purpose has no resurrection. You cannot keep anything in the ground that serves God's purpose. These are testimonies to encourage us. Each day, wherever you look, you see God. There is a natural body of people and a spiritual Body of people. There is a natural bride. I've had the privilege of marrying fine young couples, and as I look at them, I think of their hearts beating as one, Christ and His Bride. There is a natural bride testifying that there is a spiritual Bride, and there is a spiritual Bride, because there is a natural bride. All of these natural happenings forerun spiritual happenings, one accompanies and improves the other. When the spiritual Life comes upon a natural life it improves the natural life. Even a leaf, when it falls back into the ground returns in the resurrection to testify in another year in a better condition than when it went down. Everything testifies of these things. For instance all of man's natural achievements have forerun the spiritual achievements that God has accomplished through His Church. All the natural things are a type of spiritual things. Take transportation: first it was by horse, one horsepower; the early car was perhaps twenty horsepower, then came the aeroplane with hundreds of horsepower. Scientific achievements become greater and greater forerunning the spiritual promises of God's Word. The natural man looks backward for his achievement to what God has done in a former creation, studying geology, rocks, fossils and minerals, taking God's existing creation and perverting it from its original estate to improve his home and economy. Whereas in His spiritual achievement God is going forward, and the spiritual man is looking into the Word, believing the promises for things that are to be and anticipating the manifestation of spiritual revelations. Just as the scientist in his laboratory is working with existing creation to help man; the spiritual man looks forward to something God has promised, something He has not yet created. The natural man looks backward. The spiritual man looks forward. The natural church member looks back to what was in a day gone by. We are looking forward to the greater things God has promised. Science goes back, we go forward in the Word of the Lord to find what God has achieved. One foreruns or types the other: as science has been able to achieve more horsepower, God has achieved in like manner. Way back in the days of horsepower God took Luther out of a carnal monolith under His pre-eminence to let man see that "the just shall live by faith," not works, and Luther preached it. That was typed by the horse-and-buggy days and He achieved justification whereby the church received Life by believing on Jesus Christ. Then He took John Wesley under His control to take out all the isms and He was able to bring the church into sanctification. Sanctification raised the church to its feet with enough strength to walk away and separate from the things of the world. Sanctify means "separate for the glory of God." Now at the end of Wesley's age was the automobile. The Pillar of Fire and the Pentecostal Revival fell in Azusa Street, California, forerunning the aeroplane, and man took to the air, into heavenly places, into the supernatural, speaking unknown tongues, with unknown gifts, and did things that were foreign to the world church system, because he had taken off from the ground into the air. God showed by aeroplanes that His church was arising; He shows by the natural things what is happening in the spiritual. They always follow. Just as the wise men followed the Star for two years to find Christ, He has told us of the signs that would be in the sky just before His second or (Gk.) 'parousia' Coming in 1963. All of man's achievements are only types and shadows of what God is doing. He always does it that way. We see that now. It's only a pointing post. We see how science has achieved, and how God has achieved by His church. Now we have moved beyond the aeroplane age into the age of spiritual astronauts. It's the same Spirit, only more power, we can go higher, see more, believe more, be more like Christ. Not the horse and buggy, not the automobile, not even the aeroplane, but, the astronaut. It's called the Eagle Age, in the Bible. [Matthew 24:28: "For wheresoever the carcass is, there will the eagles be gathered together." The carcass is what the eagles feed on. God calls His prophets eagles and in Malachi 4:5, 6b He promised us a prophet. God calls Himself an eagle, we believers are "eaglets" and the carcass we feed on is the Word. Wherever the Word is, the true nature of the bird will show itself. An eagle must have fresh meat, what Peter called, "the present Truth." He's not a vulture; he's an eagle. He won't feed on denominational leftovers like a kangaroo run over in Luther's day. It's already contaminated. What was left over must be burned; don't leave it for the next generation. When you take communion, don't leave any left over till morning; burn it (Exodus 12:10)]! 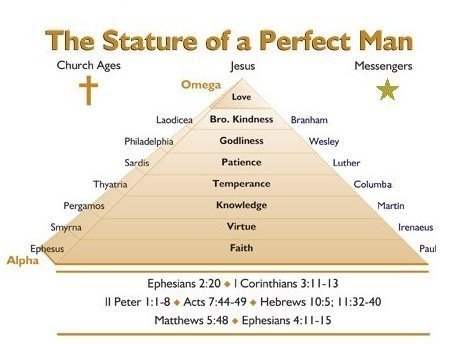 As a type of Christ (the last Adam), who is only marrying a virgin to His Word, the Christian minister (unlike the first Adam) must marry a virgin (Matthew 25:1-13; II Corinthians 11:2); and one who is in the faith. And the Church like the natural woman has a sacred virtue she must preserve for her Husband and motherhood. In the last days God is marrying a W_O_R_D Bride with a ministry that's THUS SAITH THE LORD as a man and his wife become one, when Jehovah brings His people "into the unity of the faith," He lives in His people. They are one. John 14:12, "He that believes on Me, the works that I do shall he do also." He has already fulfilled what Jesus said would take place, "As it was in the days of Sodom, so shall it be in the (Gk.) 'parousia' Coming of the Son of man" (Luke 17:30; Hebrews 4:12; Genesis 18). God has achieved what He promised to achieve in the last days according to Malachi 4. The only thing wanting is for the last elect to recognize her day and its Message and not look back to aeroplanes and cars, but for greater power to lift him or her higher into the Presence of God, where all things are possible. It's been happening since Christ opened and revealed the Seven Seals in 1963. It's called the 'rapture.' God's space cadet goes on above the creed, beyond the denominations, above those who say, "It isn't so!" He has a Guide, the Holy Spirit. The Word tells him it is so, and he moves on! Scientists figured out on paper what the natural astronaut could do. Likewise any man can sit down and read the Word of God and see what is promised. "Search the scriptures; for in them you think you have eternal life: and they are they which testify of Me." The earthbound bunch still living back in denominational days which had only PART-Word and a Mediator for their ignorance of the fullness because the Book was sealed don't know what He is. Today we are at the end of the countdown. The natural astronaut even counts backwards, "Ten, nine, eight, seven, six, five, four, three, two, one, zero!" Ten is a bad number to start with. Israel had ten tribes and they were all carnal. Jacob had to take Joseph's two sons, Ephraim and Manasseh, the prophet's children by the Gentile wife, and bless them. And, when he did, his hands crossed. And he said, "Father, not so, you've put your hands on Ephraim, it should be on Manasseh." And Jacob said, "God crossed my hands." Taking it from the older son, the Law, and placing it over on Christ the Word, and grace. And through the Cross came the change of the birthright, to the younger son. Amen. Oh, my! How wonderful! Man always counts backwards. "Ten, nine, eight, seven, six, five, four, three, two, one, zero." God starts with His number, seven. That's God's number. Watch Him, He counts ahead, starting with one. He starts with His first Church Age. There were seven Church Ages. He made the world in seven days; the seventh day He rested. That's the last number in His creation. He counts straight ahead, not backwards. He goes forward. He counted from the birth of the Church on the Day of Pentecost. The first Church Age was Ephesus; second, Smyrna; third, Pergamos; fourth, Thyatira; fifth, Sardis; sixth, Philadelphia; seventh, Laodicea." It's later than you think. It's later than you think. The counting is over. Laodicea ended in 1963 when Christ returned "as a thief in the night." The next thing is "zero," let's go. Everything is ready. The counting is over: Redemption is Over and the threefold PROCESS of the rapture has been ongoing for the past fifty-four years. One of these mornings God's achievement in space cadets who climbed into Jesus Christ by the Holy Ghost and filled with His power will take off into the sky, and the universe will be screaming with wailing and gnashing of teeth when they see they've missed it. When the great Eagle, powered by the Holy Ghost and Fire begins to spread Her wings, the astronauts will take off to meet the Bridegroom in the astronaut power of God Almighty Who sent Jesus Christ to earth, in the form of the Holy Ghost and has brought the Church through these achievements! Right now She is receiving resurrection Power to fly beyond the things of the world (Ephesians 1:17-20), seeing Him rejected and outside the church, making Himself "the same yesterday, today, and forever" (Revelation 18:4; Hebrews 13:8). Yes, sir. The countdown is over! Every Church Age has passed. Get in, my brother, sister. Get pressurized. The pressure won't hurt you when you are inside, get pressurized. Get in Christ, and you won't care what the world says. They can't never hurt you, anyhow. You're safe. You're tucked in.